Love in the Time of Global Warming was one of my favorite books last year, so whenever I found out there was going to be a follow-up, I was overjoyed. My expectations were high, and I'm glad to say that author Francesca Lia Block met every last one of them. The Island of Excess Love continues the story of Pen and her band of survivors from the great Earth Shaker. These books are all about chosen families, and Pen and company are just that -- a group of people who are family even though they're not blood-related (for the most part). They're doing their best to get by, until strange things start happening again. No one wants to leave their happy little pink house, but these kids all have a sense of knowing that there is something much bigger going on in the universe and that they have a responsibility to do something about it. As in the previous book, the group's travels are informed by the Aeneid, and they use the book to help them understand what's coming next. Although -- also like the previous book -- all because they can guess what's coming doesn't mean they're able to avoid danger and drama. There's heartbreak, broken trust, death, and lies. Block's writing is really the main draw here. This is a book that I just wanted to soak up and take my time with, to really let her words sink in. Everything about this universe is surreal and the way she writes really helps amp that up. I love everything about the way this book was written. Despite the surreal nature of the story itself, the characters feel so real. They can be easily taken in by magic and spells, they hurt each other, they beg forgiveness. There are no shortcuts or easy answers in this world, which would have been all too easy to do in a book with giants and harpies and enchantments. I do recommend re-reading or skimming Love in the Time of Global Warming first -- I had forgotten a great deal of it, so I was a bit lost for a little while. There is some sexual content in this book, along with violence and disturbing imagery, so younger readers beware. 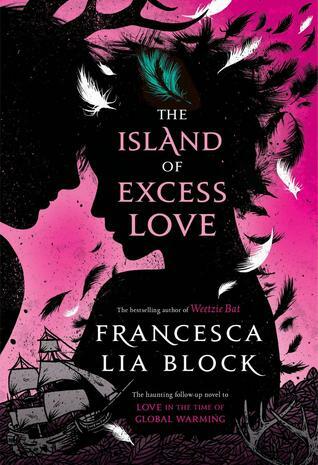 As with The Island of Excess Love, I don't think that this book is for everyone, but if you're a fan of Francesca Lia Block and/or mythology, I would definitely give it a read.